A “sin tax” is a sales tax that only applies to certain goods, such as alcohol, tobacco, or junk food. Typically, policymakers frame these taxes as tools to reduce the consumption of goods that they say have ill effects on society or on consumer health. The taxation of “sin” is one of the oldest sources of government revenue. Founding Father and Treasury Secretary Alexander Hamilton is said to have imposed a tax on whiskey before the ink had even dried on the US Constitution. Motivated as much by a need to increase revenues as by a desire to do good, politicians often claim that sin taxes will fund projects that promote public health as well as curb unhealthy behavior. Yet sin taxes often represent inefficient public policy and may lead to a host of ill effects and unintended consequences that fail to improve public health and disproportionately hurt the poor. Although selective taxes are politically more popular than other forms of taxation, states that need to raise revenue can find more efficient ways to do so—such as by lowering the tax rate and broadening the tax base. Sin taxes simply don’t deliver as advertised: they distort rather than curb undesirable behavior, they have unintended (and harmful) consequences, and they disproportionately hurt low-income taxpayers. And they don’t improve public health. For Your Own Good provides the thorough analysis of selective taxation needed to motivate better policy and will serve as an indispensable resource to many public choice economists and public policy experts. Instructors of undergraduate courses in public policy and public economics will find it a useful guide, as will graduate students and academics studying political economy. America’s history of selective consumption taxes dates back to the colonial era, when revolutionaries protested against taxes on tea and paper goods. While the Revolution was prompted in part by opposition to selective consumption taxes, this chapter describes how Alexander Hamilton implemented a selective consumption tax on whiskey to cover the American war debt shortly after America won its independence. The whiskey tax had characteristics common to selective consumption taxes we see today. The whiskey tax provided a large, reliable revenue stream for the government. Selective consumption taxes affect various consumers and producers unfairly, leading to lobbying efforts by firms that want to be given competitive advantages. Proponents justified the whiskey tax on moral grounds. Hamilton argued in favor of the tax by calling whiskey a “luxury” good that threatened the “health and morals” of communities where it was overconsumed. While excise taxes were initially the federal government’s primary source of revenue, today they account for only about 3 prevent of federal revenues. 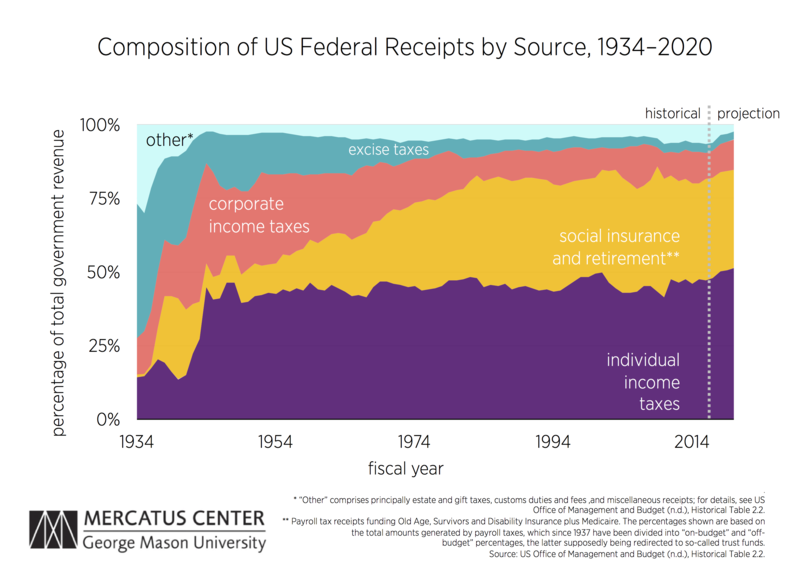 The chart above shows that, from 1934 to 2020, excise tax receipts have decreased as a share of total federal tax revenues because of the growth of individual and corporate income taxes and payroll taxes for social insurance and retirement. Politicians often frame sin taxes as sound sources of revenue that will improve consumer behavior. Economists point out that the first principle of tax policy is the value of consumer choice; consumers’ purchasing decisions reflect their choices for pursuing their best interests. Taxes that make their preferred choices more expensive will make people worse off. This chapter shows that selective consumption taxes make taxpayers worse off by changing consumers’ purchasing decisions relative to what they would choose to buy if all goods were taxed equally. Economists disagree about the appropriate level of taxation and the degree to which the government should intervene in consumer choices, but they tend to agree that selective consumption taxes cater to special interests and fail to meet the standards of sound tax policy. Economics attributes special significance to the choices made by households in their purchases of goods and services as a reflection of their own value judgments; using tax policy to coerce them into making different choices generally makes consumers worse off. Selective consumption taxes apply to specific goods rather than to a broad range of goods. Policymakers justify these taxes on the basis of the goal of reducing societal problems—like the consumption of alcohol or cigarettes—and nudging consumers toward healthier choices. But this chapter shows that selective consumption taxes are being applied to more and more goods, and they fail many of the criteria for sound tax policy. Selective consumption taxes fail the neutrality criterion. Economists support “neutral” tax policies that do not distort consumer choice. Sin taxes, with the stated goal of reducing the consumption of selected goods that consumers want to buy, violate neutrality. Selective consumption taxes fail the equity criterion. Because consumers pay sin taxes based on their individual choices, people with similar incomes may face different tax burdens. The costs of sin taxes tend to fall hardest on low-income people, who tend to spend a higher percentage of their income on excise taxes. When policymakers discuss tax policy, they are attempting to sell their ideas to their colleagues and to voters, but they frame their sales pitch in scientific-sounding language for credibility. Economists generally agree on the principles for sound taxation—for example, that taxes should be levied on the basis of taxpayers’ ability to pay. This chapter explains that politicians can spin these broad principles as support for nearly any favored tax plan. The general welfare clause of the US Constitution was originally interpreted to prevent Congress from funding any program that would benefit select groups of people rather than the population as a whole. Over time, the general welfare clause has been reinterpreted to encompass any policies that Congress supports. Sin taxes clearly affect consumers differently in accordance with their preferences for affected goods. But politicians justify these discriminatory taxes on the basis of the public good. Did you know that the Affordable Care Act includes taxes on medical providers and insurance companies—taxes that make healthcare more expensive? As MIT Professor Jonathan Gruber (one of the ACA’s architects) said, the “lack of transparency” of these obscure taxes “is a huge political advantage.” This chapter shows that when the revenue-raising tools for a policy plan are hidden from voters, the project will appear to be a better deal for taxpayers than it actually is. The ACA’s revenues include the individual mandate as well as taxes on healthcare providers and insurance companies rather than taxes applied directly to consumers. While the ACA is a highly visible and controversial piece of legislation, a study of its revenue systems provides broad lessons on tax policy. Politicians who are seeking to appear as if they are providing constituents with large benefits at a reasonable price will attempt to obscure the cost of the programs they implement, reducing transparency in the process. Chapter 6 | Earmarking Tax Revenues: Leviathan’s Secret Weapon? You’re probably familiar with the earmarking of selective consumption taxes in your state—for example, gas tax revenues may be dedicated to highway funding. However, tax revenues don’t always “stick” to the program that they’re earmarked to. This chapter shows how earmarked taxes can serve to increase the size of state governments because funds can be moved from program to program. States may justify new revenue sources with the argument that they will fund worthy programs. A lottery may be implemented with the argument that its revenues will be used to increase education funding. Every US state earmarks a percentage of its revenue. In 2005, Rhode Island earmarked just 4 percent of its revenue, compared to Alabama at 84 percent. Selective consumption taxes can be charged based on a good’s value or on the number of units of a good sold. This chapter demonstrates that basing taxes on units purchased may cause consumers to switch to purchasing more expensive or more potent versions of the good, because the tax reduces the price differential between more and less potent versions of the good. The tax on a “sin” good will reduce the sales of the good that is taxed, but it may also lead consumers to use more harmful versions of the good. If the structure of a sin tax encourages consumers to switch from beer to liquor, for example, the tax’s health effects will be ambiguous. Taxes based on the price of a “sin” good may be more effective as deterrents because they will cause consumers to reduce their consumption of the good without encouraging them to switch to more potent versions. US drug policy has a long history of providing revenue for federal, state, and local governments. Before the War on Drugs, opium and cocaine were legal and medical professionals who prescribed these substances had to pay extra taxes to do so. This chapter explains how, as the federal government began enforcing outright bans on drugs, law enforcement agencies took advantage of their newly acquired authority to profit. Today, civil asset forfeiture related to drug crimes provides officers with incentives to use and abuse their authority and increase their revenue by making more drug arrests. Drug policy has a long history of providing law enforcement with increased revenues and authority over time. Law enforcement agencies may be targeting the crimes that present the opportunity to raise revenue for their departments rather than the most serious public safety threats. 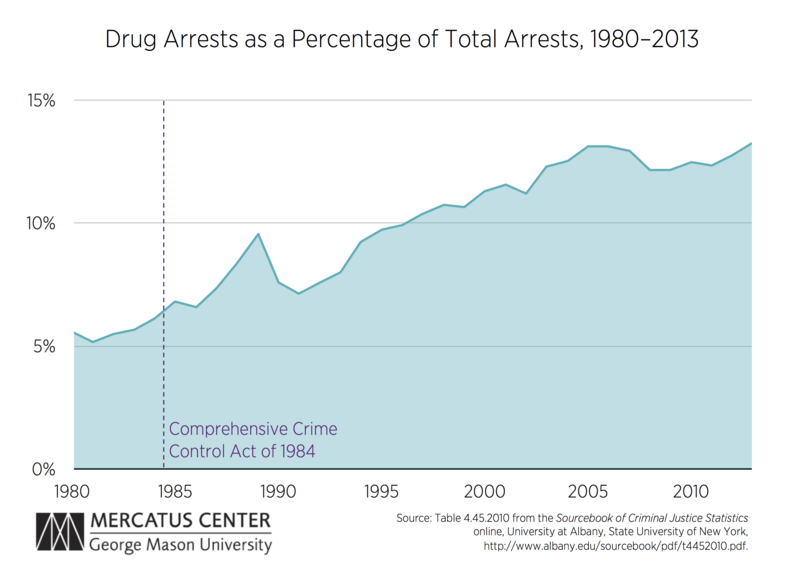 The chart above shows that since 1980, drug arrests have increased from 5 percent to 13 percent of the total of all arrests. In 1984 President Reagan signed the Comprehensive Crime Act, which implemented “equitable sharing” of civil assets seized during drug investigations in which federal, state, and local governments work together. Following this act, state and local criminal justice systems began reallocating resources to drug enforcement. Gross receipts taxes are essentially a type of sales tax, but they’re levied at each stage of a good’s production rather than just at the final sale to consumers. Eight states—Alabama, Delaware, Florida, New Mexico, Ohio, Pennsylvania, Texas, and Washington—use gross receipts taxes. Ohio’s constitution prohibits sales taxes on food, and this chapter recounts how in 2006, the Ohio Grocers Association sued the state for its gross receipts tax, arguing that the tax is indistinguishable from a sales tax. The Ohio Supreme Court ruled that the gross receipts tax is a tax on “the privilege of doing business” rather than a transactions tax, upholding the policy. Compared to a simple sales tax, a gross receipts tax will result in a larger tax burden on goods that require more stages of production. Gross receipts taxes give businesses an incentive to minimize transactions between firms. When taxes apply to firms’ gross receipts rather than their profit, the taxes are a larger burden for firms with low profit margins (like grocers) than is a sales tax. Did you know that some lucky companies have agreements with state and local governments to pay less in taxes than their competitors? These deals are called “economic development tax incentives,” and they are all justified in the name of creating jobs. But do they? Is it the job of the government to decide which businesses succeed and which ones fail? How do these deals affect political contributions? This chapter reviews the consequences of such targeted tax incentives, showing how these deals hurt taxpayers and providing policy recommendations that would treat all businesses equally. Governments sometimes take taxpayers’ money and give it to a few favored corporations. If states are going to use targeted economic development tax incentives, disclosing their costs would improve transparency. Your tax dollars pay for sports stadiums. You read that right: your hard-earned money is given to billionaires to help fund their businesses and hobbies. In this chapter you’ll learn about the wide variety of taxes used to finance stadium and arena construction, and about who benefits the most from the construction of sports stadiums and arenas. Proposed stadium projects often give rise to rosy predictions that millions of dollars in benefits will flood the local economy, but studies after the fact often find a small or even negative impact on the economy. 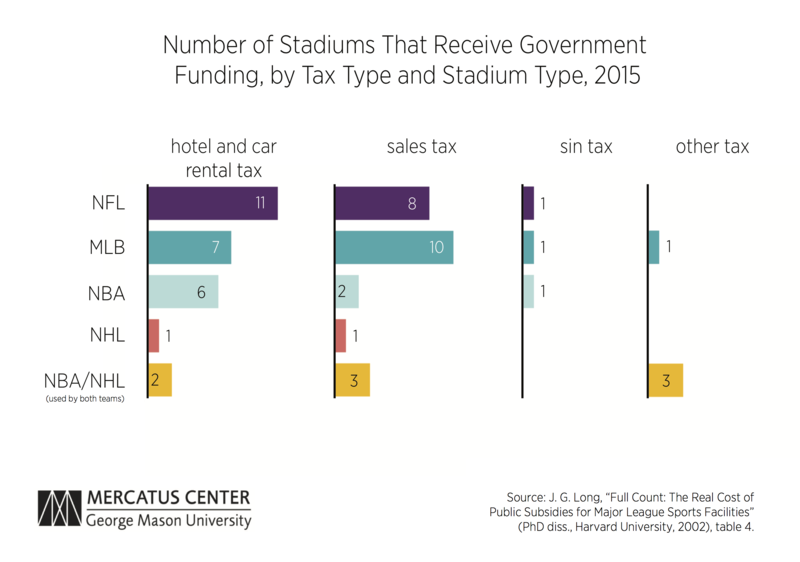 The costs and benefits of taxation to subsidize stadiums need to be carefully considered; while policymakers tend to sell only the benefits, voters should be permitted to weigh stadium spending against alternatives. The chart above shows the number of sports stadiums that are funded by selective consumption taxes. This chapter examines a growing phenomenon in pension funding in which jurisdictions enact a new selective tax or fee, or increase an existing one, to reduce unfunded pension liabilities. Selective sales tax refers to a sales tax confined to a particular commodity or a limited number of commodities, such as a tax on sales of liquor, cigarettes, gasoline, or other petroleum products. Because this is a relatively recent practice, this chapter describes the trend and notes commonalities among jurisdictions that are dedicating selective taxes to pension funds. In addition, it frames the importance of public pensions to the finances of state and local governments. Unfunded public sector pensions are a growing burden on states and localities, and they present risks to current and future taxpayers. The phenomenon of jurisdictions enacting a new selective tax or fee (or increasing an existing one) to fund their unfunded pension liabilities is becoming more common. 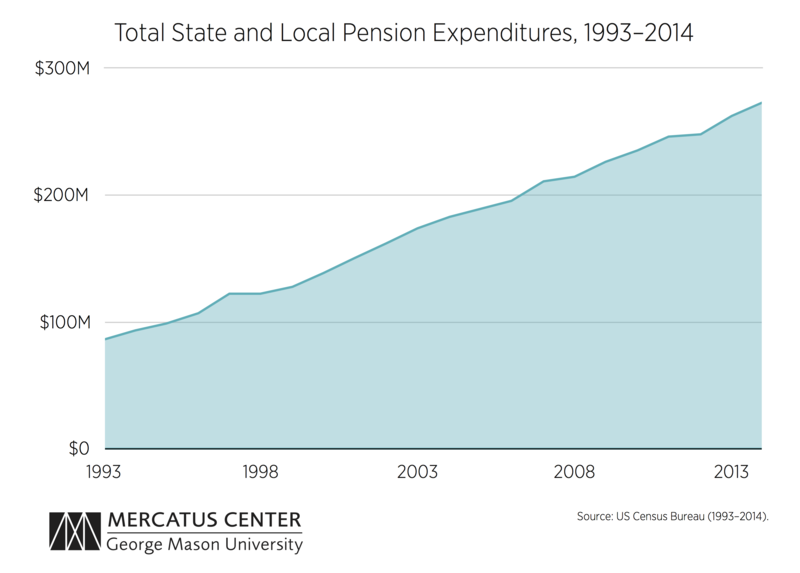 The chart above shows the growth of state and local spending on pensions. 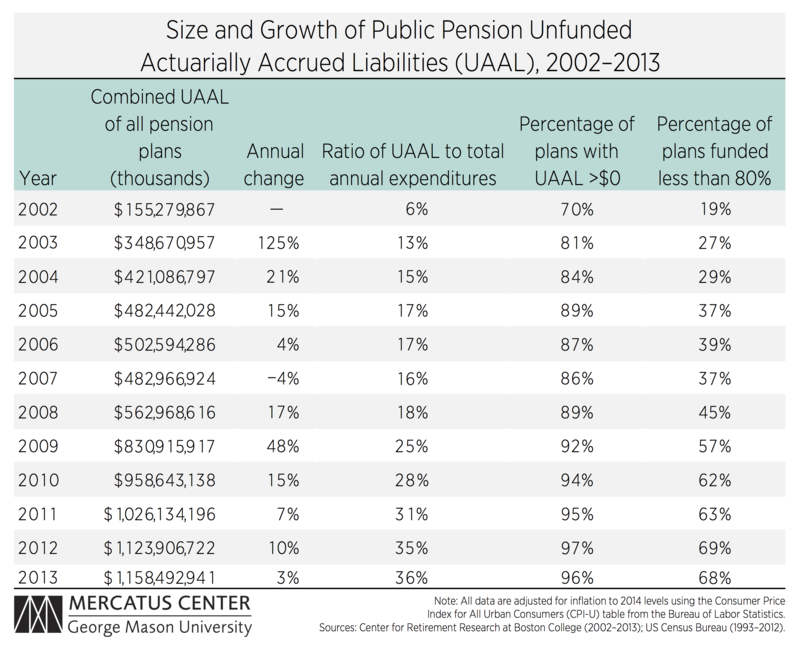 The table below shows that in spite of increased spending on pensions and the earmarking of dedicated taxes toward pensions, unfunded liabilities are increasing. What is the best tax structure? Neither pundits and politicians nor economists can say for certain. Many have suggestions, but in reality there is no one tax system that will work for every state, let alone every municipality. The reason is simple: The broader policy environments underlying tax systems change over time. This chapter offers a radical tax reform proposal to address the impending state fiscal crisis. Federal taxation should be replaced with “Tiebout taxation,” where all taxes would be collected by the states and a uniform percentage of the state revenue would be given to the federal government. Tiebout taxation won’t reveal the ideal tax code, but it will create fiscal incentives that will help by decentralizing the power to tax. Recently, many local governments have tried to fight obesity by taxing “unhealthy” foods, requiring calorie information on menus and vending machines, or placing moratoriums on the establishment of new fast food restaurants. But are all these measures really helping to combat the obesity problem? This chapter discusses some of the unfortunate consequences that result when governments try to pick what you should and shouldn’t eat. Government attempts to change human behavior usually backfire and fail. Policymakers try to sell sin taxes as both a revenue source and a tool to improve health outcomes, but they can’t do both effectively. Cigarettes are a legal product. People who use cigarettes usually strongly prefer them. The high taxes imposed on cigarettes in various states create profit opportunities for those willing to buy them in low-tax states and ship them to high-tax states for resale. Thus, the product is attractive to lawbreakers. This chapter shows how raising cigarette taxes creates a black market for cheap cigarettes and leads to interstate smuggling. Cigarette taxes have increased over the last decade. Between 2005 and 2013, state governments raised taxes on cigarettes 72 times. Very high tax rates in some jurisdictions result in rampant smuggling. The estimated revenues lost to cigarette tax avoidance are $5.1 billion. Prohibiting a popular product leads to black market trade, crime, and violence. Did you know that after San Francisco banned plastic bags, the documented cases of E. coli–related ER visits went up by about one-fourth? Or after governments banned plastic bags in Palo Alto and Malibu, California, and in Fairfax, Virginia, there was a 46 percent increase in deaths from foodborne illness? This chapter makes a strong case for reevaluating plastic bag bans and taxes, and urges policymakers to think about all the actual costs associated with such restrictions. Plastic grocery bag bans and taxes are becoming increasingly popular, but these bans have unintended consequences. Bans and taxes on plastic bags may not actually achieve their stated goal of reducing carbon emissions because people who would be reusing the bags for another purpose (such as lining trash cans) instead use bags made of thicker plastic. When it comes to gambling taxes, house rules apply. State governments have the prerogative to decide whether to allow lotteries or casinos to operate in their states. This chapter explores the expansion of legal gambling in the United States, focusing on the taxes states get from lotteries and commercial casinos—and offering a potential explanation for the new “Sin Cities” across states and the internet. Increased competition in the gambling industry is a catalyst for reconsidering gambling policy. Technology-related gambling will change the way states regulate gambling. The gambling industry will be very different in 10 years. Which states are the most paternalistic, in terms of telling you what you can and can’t do? Which states tax individual choices like gambling, smoking, or using plastic bags most heavily? This chapter ranks the states according to how much their tax codes distort individual choices in private markets. The ranking shows which states try to control your choices by taxation, and which ones leave the choices up to you. The indexes in this chapter can help policymakers understand the level and potential harm of paternalism in their state. Federal, state and local tax policy is a mess. The 2,600 pages of the federal tax code are maddeningly complex and unnecessarily inefficient, but why? This chapter gives a detailed account of how the tax code got to where it is today, the role that special interests have played in creating a bloated tax code, and how we can make the tax code fair for all. Our tax code is a mess because it reflects the interests of groups looking for special tax treatment. It’s imperative that we understand the history and origins of special interests’ influence on the tax code in order to clean up the mess.